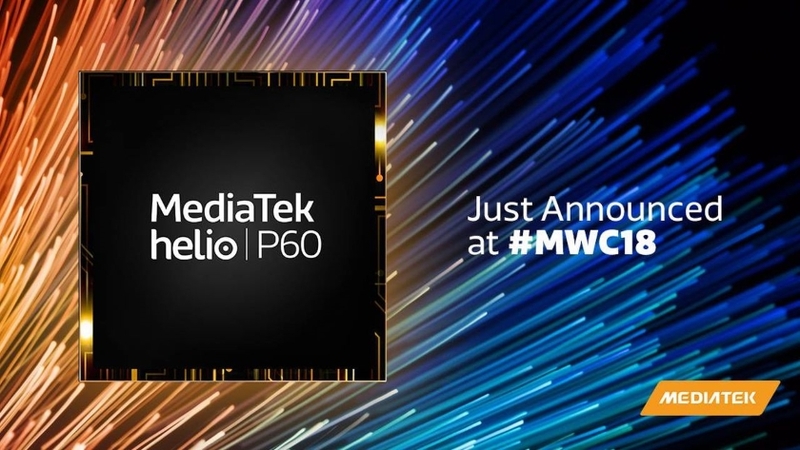 Company MediaTek at the exhibition MWC 2018 in Barcelona announced its new mobile chipset P-series. It's called Helio P60. The processor is built on a 12-nm FinFET process, which reduced power consumption by 15% compared to 14-nm processors. The eight-core chipset has a clock speed of 2.0 GHz and it uses the big.LITTLE architecture. These are 4 cores Cortex-A53 and 4 cores Cortex-A73. It also boasts a new graphics processor Mali-G72 MP3 with a clock speed of 800 MHz. According to the company, it provides an increase in productivity in games by 70% compared to the previous generation of SoC. Like other chipset manufacturers, MediaTek has added a dedicated processor to its new SoC for AI capabilities. NeuroPilot is a special task unit that processes information on the device. It will perform tasks such as determining the depth of field of the face and objects in the image, as well as improving the performance of VR and MR.
Helio P60 supports a dual camera of 20 Mp + 16 Mp or one module up to 32 Mp. It is also capable of processing HDR shots in real time, thereby showing users how the photo will look after shooting. The company has not yet disclosed the information on the supplies. So it is not known when we will see the first smartphone on the Helio P60.